I think you can do multiple degrees in the same application; i.e. you only send one application form with all the information filled and documents for both degrees to the same institute. You can also do it separately, but might cost you more. Also, you might not need to count all degrees towards EE as only the highest degree gives you max points. Go through Education Credentials Assessment (ECA) for all degrees? I submitted by WES request for US Bachelors on 12/15/2017 and received it today 02/02/2018. In the case of my wife, one of her bachelor’s degrees (she has two) is from India and that Bachelor’s degree is in her maiden name. Does anyone on this forum have experience presenting degrees with a maiden name to WES? I imagine this is fairly routine but was surprised not to see any way to express multiple names on WES’s form. Also, I was unable to find this topic on their FAQ. 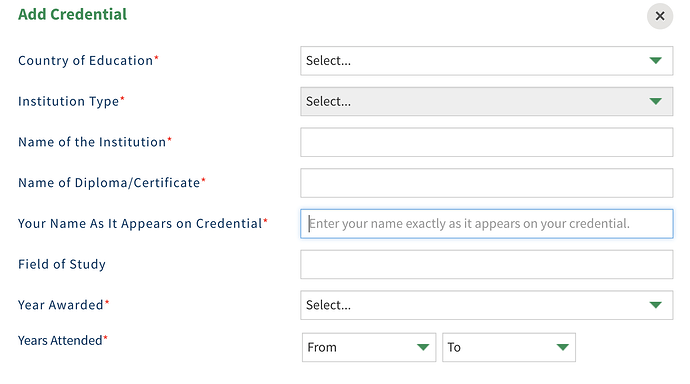 Although I still haven’t discovered an explicit maiden name field in the WES process - it is possible to specify different names for each degree. So that is a step forward. Does the express entry profile allow me to input my spouse’s maiden name? At this point I am wondering which entity will establish that my maiden name spouse is the same individual as my current name spouse. Just wanted to share my experience here. I got my IELTS results on Friday, so I went ahead and started building my EE profile, but I didn’t realize I would also need my education evaluation results ready to complete the EE profile… This was something that I had overlooked and now I’m at least about a month behind the timeline that I had in mind initially. Hopefully this could be some useful information for others who are currently preparing for IELTS and their education evals. 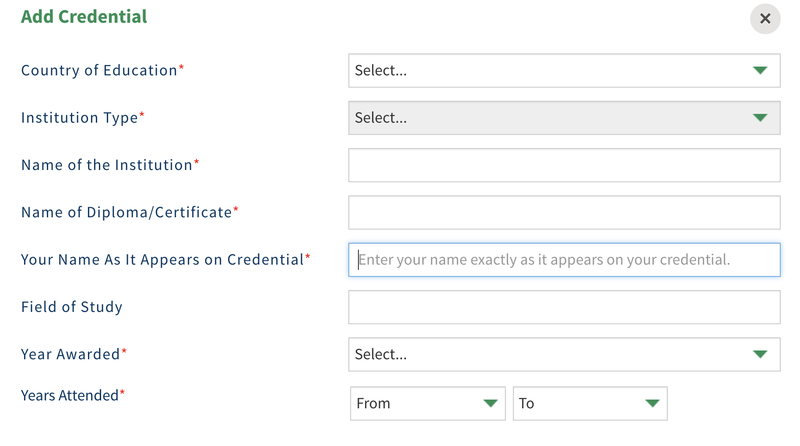 This is a common problem, what you can do is when creating the WES Profile in the Add Credentials part you will be asked for the name as it appears on the credentials. In there input the maiden name. Additionally you will have to send WES Proof of name change which can be your marriage certificate, passport copy, etc. Keep in mind even after all of this WES can mess up the name it happens often enough in that case you can either go back to WES or submit as is along with the name change proof to CIC. I would say make a checklist in a book you’ll have all kinds of details to keep in mind as you progress. In fact maybe I’ll try and make one this week and share. Thanks ! Thats helpful - writing to WES with additional documents sounds like a great idea. That’s good advice for all. For my specific case though, I was aware of getting the education evals done. However, I didn’t realize they would need the eval results as early as the IELTS when building your EE profile. I had thought the education evals were not required until after ITA together with police clearance, employment letter(s), etc. It’s a minor slip up nothing to stress over will only delay filing by a bit. Do WES or other evaluating agencies really need transcripts? Also, Do we really need to send sealed envelope directly from University to WES or Can I courier myself? Last question, Has anyone used any other agency other than WES? I had used both BCIT and Univ. of Toronto (long story) for my application in 2016 and both did require transcript to be sent directly from university to them, sealed. This was easy with my US university as the process was all online and quick but long and involved with Univ. of Pune as you can imagine. But my parents did it for me from India. Check on WES’s instructions and call and ask them if necessary. I’ve read on other posts that WES is OK if you send them the latest transcript sealed from univ -> you -> WES but confirm this with them first. If they say they need it from the university directly you don’t have a choice. Edit: And yes, transcripts are mandatory, atleast when I applied. Marksheets and Degree certificates alone won’t work. thanks… In that case should I create account with WES or others first and then apply transcripts in university to be sent directly to them? or when should be really ask university to send transcripts to them? how do WES or others identify its sent for me? Just by name? Before you send documents, you must submit an application and get a reference number. Include your WES reference number on all envelopes and correspondence. WES is not responsible for documents that arrive without a reference number. Documents that arrive in our office without a reference number may encounter processing delays. Do not send original documents unless specifically requested by WES. All documentation received becomes the property of WES and cannot be returned. I would say that if your Indian university is going to take 2 months just to send the transcript to WES or others, it’s worth doing the transcript thing first. Call and check with WES whether they match your transcript name to your application name or what. BCIT and UofToronto matched my name on transcript to my application and all was good. In one case, the application was submitted before transcript reached them and they processed it after they received the transcript, and in another case the transcript reached them first and was with them for two weeks before I submitted my application. Again, call and check with the evaluating agency what they prefer. Now your quoted message says it should have a reference number written on top of it. So I don’t think university personnel will agree to mention a WES reference number on the envelope when sending directly to WES. Which is why I suggested to call WES and confirm whether they need it directly from the university or not, or whether they need a reference number or not. When I did my ECAs in 2016 - I did a total of 4 ECAs for my 3 degrees, long story - from BCIT and Univ of Toronto, they did not require any reference number, they just matched the names for all transcripts I sent them, be it from the US or India. When I did my ECAs in 2016, WES was the worst agency in my opinion to do the ECAs because their website wasn’t functional, they won’t pick up service calls etc, whereas BCIT and UoT were stellar! Now I hear WES is the best based on other people’s recent experiences. So things have certainly changed! WES also seems to have slightly difference requirements than other agencies, from what people have said, for e.g., people say they don’t need transcripts from university directly to them. Which is why I was suggesting that you call WES and get this cleared. I checked again on WES website and it do asks for Bachelor’s document also if you are getting evaluated yours Masters. For all applicants submitting a Master’s Degree or PGDip earned on top of a three-year Bachelor’s Degree (12+3+2), you must also provide your Bachelor’s degree documents. WES cannot complete an evaluation without these documents. so do i need to send them two Transcripts? I did my Bachelors from a different university and Masters from other one. Do we need to enter CIC in list of organizations getting WES report result or should i just add my address and then just need to enter WES findings during express entry application? Edit: I see CIC is added by default by WES for electronic copy. My name in my Bachelors and Master is different than my current name (after marriage). My universities will send transcripts with my maiden name, i guess. So do i need to send my marriage certificate or passport copy separately to WES? Can I choose WES and Can my husband choose other agency like BCIT or IQAS or other? or it should be same for both in same application? I think they mean a BS/MS prog where you spend 3 years instead of 4 years in bachelors and then 2 in Masters and get both BS and MS degrees. That’s why they’ve probably written (12+3+2). This is not uncommon in US, I don’t know about India. But again, I would confirm with them just to be sure. I think the marriage certificate will be a part of your application anyway since you and your husband will be on the application together. If you want you can add this name change detail in a letter of explanation. I’ll defer to people who have applied as a couple, to answer this question. But I don’t think it matters who you get your ECA from. In my case, I had one ECA from UofToronto and two from BCIT and it didn’t matter.